UTM party presidential candidate Dr Saulos Chilima has said his government will put much emphasis of developing Agriculture starting with the announcement of cheaper farm in pots like fertilizers. 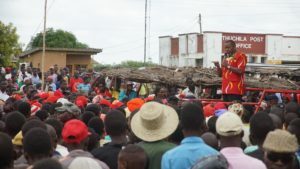 Chilima who is also the country’s Vice President spoke at Masubi Primary School ground in Mulanje Bale Constituency during a campaign political rally Saturday afternoon. “We know what we are doing and we will announce the new prices of fertilizer by the end of this month and I can assure you that it will be cheaper than the K10,000 ,” said Chilima. He said his administration will improve Agriculture because it understands that a man without food in his stomach spend his time on food and not on development while a man with food in his stomach spend his time on development. “We want everyone to afford the farm inputs and not through some coupons which do not benefit the real people who require these inputs,” said Chilima. Chilima said UTM was established to help people who are struggling in the country because of mismanagement. “Why do we smile wearing cloths made in China or South Africa and yet they use our cotton.? Who said we can not have textile industries here in Malawi.? “Malawi need to bring back its textile industries so that our young people should be working in such areas. 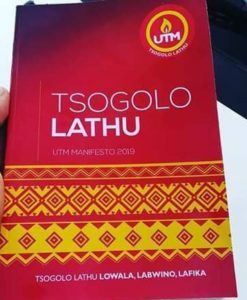 This is possible and it will be done by the UTM government,” said Chilima. He said similarly, Mulanje has potential of producing fruit products like tomato source and others for sale outside the country. “We just have to believe in ourselves and with good leadership from UTM we will achieve this,” assured Chilima. 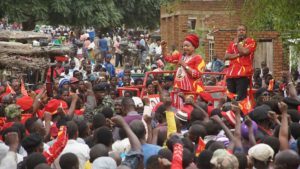 “It is time we stop listening to these who doesn’t believe that we Malawi can change simply the want want us to continue to be beggars,” said Chilima.